Have you ever attended a retreat? Are you curious about what they’re like? July 16th, 2016 – I will be co-hosting The Rooted Retreat for women with my good friend, colleague, and wellness expert Inkeri Young. Ink and I decided to put together The Rooted Retreat (a day to get back to you) because we have both experienced, first hand, the power of taking a day for ourselves to disconnect from our busy modern lives. The Rooted Retreat is a way for YOU to re-focus your energy, combat overwhelm, and troubleshoot your biggest issues related to health, nutrition, and motivation. You will have the opportunity, in a bucolic family farm setting, to experience the power of one-on-one coaching with the support of a small group of like-minded sisters. The day will be made up of engaging presentations by Inkeri and Annick that cover topics from healthy eating to conquering overwhelm. There will be breakout sessions, personal attention, and collaboration with other attendees. There will also be some time to meet the animals and tour the farm. Oh, and did I mention it’s going to be fun?! This is a great event to grab some of your closest lady friends and make a weekend adventure of The Rooted Retreat. #1. Seats are limited. We have decided to keep The Rooted Retreat intimate. Once we fill all spots, doors close. As of today, we are already 1/3 full. #2. Take advantage of the Early Registration pricing! This special pricing expires June 17th. You can find all the information about the The Rooted Retreat HERE. 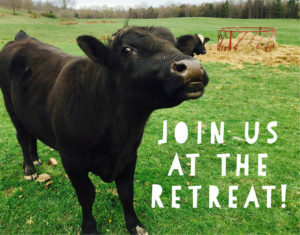 The Rooted Retreat is the escape YOU deserve! Inkeri and I would be honored to have you be part of The Rooted Retreat. Let me know if you have any questions. Most can be answered HERE.